First Chapter Plus brings you Chapter 1 of 100 books! First Chapter Plus announces the best of new fiction and non-fiction books, PLUS you get to read the first chapter free! No need to register, no obligations, just click ‘n read the May 2011 issue now! 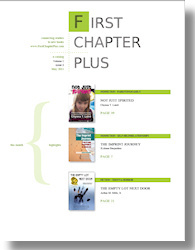 Authors, publishers, and publicists are encouraged to visit First Chapter Plus and find out how 5,000 librarians and booksellers can find out about your new titles each month. The Whole Youth Worker: Advice on Professional, Personal, and Physical Wellness from the Trenches, 2nd Ed.